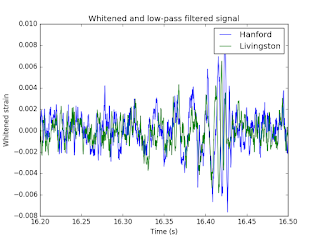 Two lines of signal processing will dig out the gravitational wave signal! waves had been predicted by Einstein’s general theory relativity, but never before detected. which are spaced approximately 3000 km apart. These detectors measure strain (∆L/L) as a function of time. Here ∆L is the variation in length and L is the total length in which the variation is measured. gravitational-wave induced ripples in space-time. event is in fact real, and not caused by e.g., local seismic activity. Now with three stations, triangulation can be used to determine direction of arrival for LIGO events! routinely used by LIGO to improve the sensitivity of the instrument. In fact the signal processing techniques are so simple that an undergraduate can implement them from scratch in a few weeks. That is exactly what I had my students do for their midterm exam in the signal processing course this year. Out of 46 students 45 managed to dig out the gravitational wave signal on their own, albeit with some specific instructions on what sort of techniques to use. I didn't want the students to just copy the publicly available LIGO signal processing tutorial, so I though I'd send the students down a slightly different path, which is even more simple than the one in the tutorial. My course is a very basic one, which doesn't cover statistical aspects of signals, so this technique involves no statistical processing! Technically, I guess I could have reduced this to one line, but that wouldn't have fit the line width on this blog post. The full code, which includes reading LIGO files and plotting is shown below. You can download the data here and here. 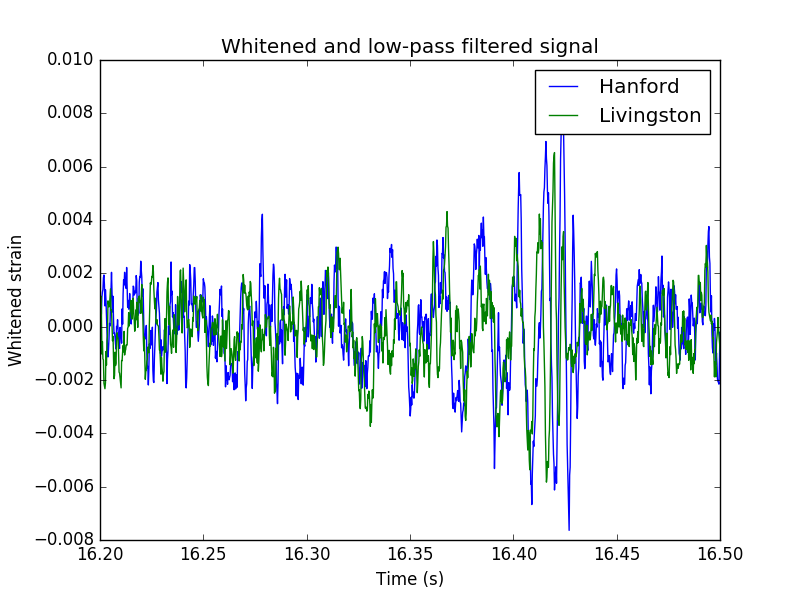 # Signal processing to clean up mechanical vibrations from LIGO data. # The idea is to use very simple signal processing concepts.